The Casey Trees Water By-Cycle crew has made tremendous strides these past two weeks Jonathan, one of our summer interns who started out never having ridden a bicycle, experienced his first full day of caring for trees by bicycle, riding over 9 miles and watering over 30 trees on Capitol Hill and in Eastern Market. He was awesome and biked like a champ. 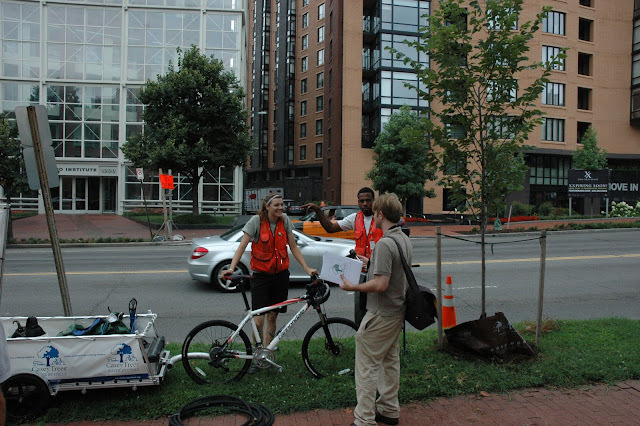 The following day our crew worked downtown along Massachusetts Avenue caring for trees that have not been adopted by any person or business in the neighborhood. If you call our office we will happily tell you where trees still need to be adopted and how to properly water them. We spent a lot of time watering these newly planted trees and were rewarded with bright green leaf buds the following week. This past Thursday, Casey Trees officially launched the Water By-Cycle at Samuel Gompers Park after weeks of successful trial runs. We we’re interview by Patrick Madden from WAMU, (see above) and Mike Galvin christened the trailer and its brand new signs with a bottle of Sports Drink – poured, not broken. Casey Trees does not litter! While the summer is coming to an end, the Water By-Cycle is still making its rounds. Be sure to say hello or ask a question about tree care or how you can get involved with Casey Trees.